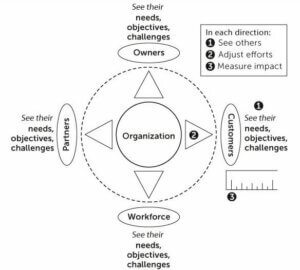 The Great Challenge for today’s Organization. If you’re communicating your strategy, is it being heard and understood? The data shows it may not be. When Harris Interactive and Franklin Covey surveyed over 23,000 employees some years ago, they discovered 80% of workers reported having no clear line of sight between their tasks and their team and organizational goals. In a recent Australian study, 71% of employees couldn’t correctly identify their company’s strategy. Another MIT study showed that 45% of middle managers couldn’t name even one of their company’s top five priorities. This predicament is similar to a college marching band where the students don’t know what tune to play or which direction to move. While each student individually knows how to play their assigned instrument and can improvise, they will never achieve the band director’s intended vision if they are unsure what to play, where to move, and when to time their actions. Do you have a strategy to create value for your customers and stakeholders? We need someone to facilitate the strategic planning process. We have a plan, but we need to implement our plan. We need to build a strategic plan virtually. The Value Creators GPS strategic planning system provides an approach that is simple yet robust and comprehensive enough to serve large and small corporations, non-profit organizations, Chambers of Commerce, and Churches. Our system is fully scalable to meet your organization’s structure and size. Through our organized, three-phased approach, strategic planning will not be such a daunting task. The GPS System. A simple strategic planning system that will help you create the value to prosper! The Game Plan – a strategic plan that you can fit on the size of a poster that states who you are, what you do, why you do it, and how you will get it done. The Scoreboard – a strategic scoreboard that enables you to measure success, create accountability, adjust your efforts, and fully execute your game plan. We combine professional facilitation with proven strategic planning, the GPS System, to make sure your time and energy that goes into building a strategic plan pay off. Have you ever spent hours developing a plan that didn’t get executed? That is not uncommon. Growing your organization is natural – when you have the right facilitator and the right planning system to go from a plan on paper to a plan fully executed. Whether you’re developing your first strategic plan or redefining your organizational strategy, Value Creators Facilitation Process will help you set up your organization to prosper. Strategic planning done right can be a challenge. Your strategic plan sets the direction of your entire organization, team, or division so it cannot be dependent on the participants themselves to lead it. Get the professional help that will guide the group to commit as a team through the process. Whether you’re executing a long-term strategy process or simply holding a two-day planning retreat, the GPS System provides you with four primary deliverables that are critical to the successful implementation of your plan. Your Situational Assessment. An Assessment of your current situation. Your Strategic Game Plan Poster. A 22×28 Poster Summary of your plan. Simple, yet robust and comprehensive enough, the GPS System is scalable to the strategy development needs of Fortune 500 companies, to non-profit organizations, to government agencies, to small departments, to more. Build trust. Encourage collaboration. Enhance problem solving.